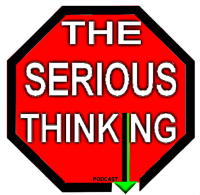 The uniqueness that characterises this podcast is represented by its deeply controversial topics and the critical ways in which they are approached. Let’s cut straight into these very difficult topics without the use of any belief systems or fallacious-based explanatory framework of analysis. Throw out the conspiracy theories, spiritual or ‘New Age’ ideas, rhetorical or motivational advice, political positions, ideologies, sensationalism, polemical view-points or deliberately shaped but merely subjective controversies. The promotion and implementation of high order thinking skills and critical approaches often referred to yet not fully implemented in current educational systems. Deductive approaches to salient elements that characterise the life and cognition of us all. The development of deductive discussions aimed to support the mission. Implementation of personal multi-logical thinking skills. Promotion and application of solid criticalness and accurate reasoning. This conversation contains very important points, not quite because of what the speakers say but because of the contents and the topics that are investigated. This material & approaches will be used via webinars lectures and Q/A in some psychology classes throughout a collaboration between EOF Project and some university departments. The goals focus on applying innovative cognitive programs and approaches aimed to improve critical intelligence among the candidates (and obviously produce data collection). _ When we have patterns we don't quite like, assuming we are aware of such patterns, then why do such patterns continue to exist in the mind and behavioral psychology? _ What is the difference between a habit and a ritual? _ What's making them persist? Is it because they give us a sense of psychological security? If so what is that security all about really? Is that really security? And does that sense of psychological security we carry carries some unquestioned epistemic or existential authority? _ Can there be psychological security with no authority?